Used Cars Financing is not much different from New Car. 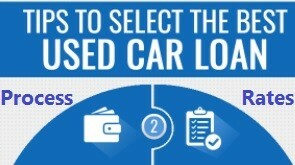 However, unlike New Cars - where Sole Criteria Consideration is about Credit Eligibility of Individual - Used Car Financing Involves both Credit Eligibility and Asset Assessment i.e. Involves additionally Used Car Assessment by Financing Institution. Vehicle Documents: Copy of RC of Car seeking Finance. If Loan on Car - not Necessarily but Foreclosure Statement is also asked for. Bank then make a Disbursement Cheque in favor of Seller or Part Payment in Old Financier Name and Seller. Cheque is usually handed over to Seller - only once the Transfer Forms and Documents are handed over to Bank empanelled agency - who does RC Transfer work in RTO and to ensure HP is duly added to RC.